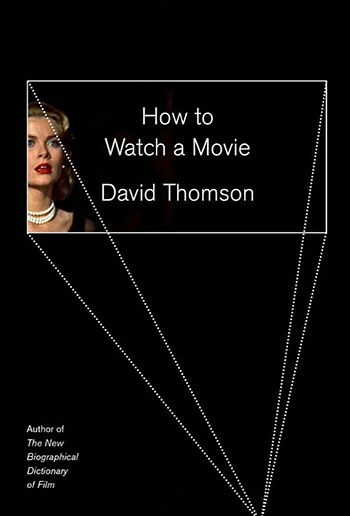 If anyone can get away with writing a book called How to Watch a Movie, it's David Thomson; surely, a man who has spent the better part of 50 years living and breathing cinema would have some valuable and innovative techniques to offer on how someone like me, a longtime film lover, can get more out of my next trip to the movies. However, How to Watch a Movie reads less like a manual or guidebook, and feels more like a lazy afternoon spent at a cafe with one of our greatest living film critics. That's pleasant enough, but I expected a guidebook. Other readers’ experiences will primarily depend on whether or not they temper their expectations before approaching a book with such an overambitious title. All too often How to Watch a Movie strays into cinematic navel-gazing territory, repeatedly relying on a few key films (the usual suspects -- Citizen Kane, Vertigo, etc. -- and a handful of more recent films, including Locke and All Is Lost) to draw familiar conclusions about different ways of better appreciating film. The novice cinephile will find a great deal of useful information in these pages, however, occasionally the author’s conclusions feel obvious. I approached Thomson’s book seeking concrete steps and perspectives I could take with me for my next trip to the movies. Instead, it occasionally feels as if the critic is talking down to the reader, presuming his audience is mostly comprised of casual filmgoers, rather than more experienced cinephiles. In a late chapter Thomson supposes that “there’s a good chance you don’t know what an aspect-ratio is.” Really? Elsewhere, the critic informs us that shot selection is “not casual”. It is surprising that Thomson -- among our most learned and scholarly film historians -- seems to have little idea of the primary reading audience for a book such as this. Which is not to say that there are not fascinating and provocative insights scattered throughout How to Watch a Movie. Foremost among them are Thomson’s questions regarding how rapidly advancing communications technology is changing our experience of watching film. For many of us, claustrophobic laptop and smartphone screens and on-demand streaming services have replaced the movie theatre as our primary means of watching movies and, as Thomson deftly describes in a passage describing the spectacle of cinematic violence, “film only works in the dark… because of that safe distance from life.” Can we truly appreciate, and dissociate from the horror of The Silence of the Lambs at three in the afternoon on a four-inch smartphone screen? And what of sound? One of the great thrills of movie theatres is feeling in our bones, from our feet to our posterior and beyond, the sound of the movies, whether it's gunfire or waves crashing on the beach, the unique rumble and cadence of certain voices, the swelling strings and percussion of the film's score. How much information do we lose when viewing films on a tiny iPhone, our loss compounded by the often shoddy fidelity of YouTube? The book not only inspires the reader to better appreciate the cinema-going experience itself, but also to take greater notice of what’s happening beyond the screen. “At some time in your moviegoing you should give up the screen for a moment and study the people watching, their features bathed in light,” Thomson writes, “Those faces are like the ones on the screen.” (Echoing Oscar Wilde’s assertion that “life imitates art far more than art imitates life.”) If nothing else, Thomson’s prose renewed my excitement and eagerness to patronize my local theatre in lieu of yet another couch-bound Netflix binge. In the book’s most engaging chapters, on the joy of re-watching films and the distinction between “watching” and “seeing”, Thomson also succeeds in further illuminating the brilliance of canonical titles such as Citizen Kane, arguing that this might have been the first American film to require of its audience multiple viewings. (Hence it’s initial rejection by American audiences, unaccustomed to such a challenge.) Describing this facet as Citizen Kane’s most “daring novelty”, “unknowability is close to where this film is leading”, writes Thomson, “For 1941, that was not just daring or innovative; it was close to a denial of the entertainment medium.” It's an impressive accomplishment to succeed in encouraging reinvigorated analysis for endlessly scrutinized, longtime critical darlings such as Citizen Kane, Persona, and Vertigo. Still, I left How to Watch a Movie wanting: wanting more techniques and strategies that would enhance my filmgoing experience; wanting something more tangible, concrete; wanting to see through if you will Thomson’s critical eye. Perhaps the grandiose ambition reflected in the book’s title soured my experience. Perhaps the lesson I initially overlooked is that each of us should develop our own individual ways of watching film, drawing on the insights of masters like Roger Ebert, Slavoj Zizek, and David Thomson, while at the same time cultivating and observing our own unique methods of seeing and perceiving; indeed, to borrow Thomson’s phrase, to “watch ourselves watching” a little more closely.